A northeastern state in the American Union. 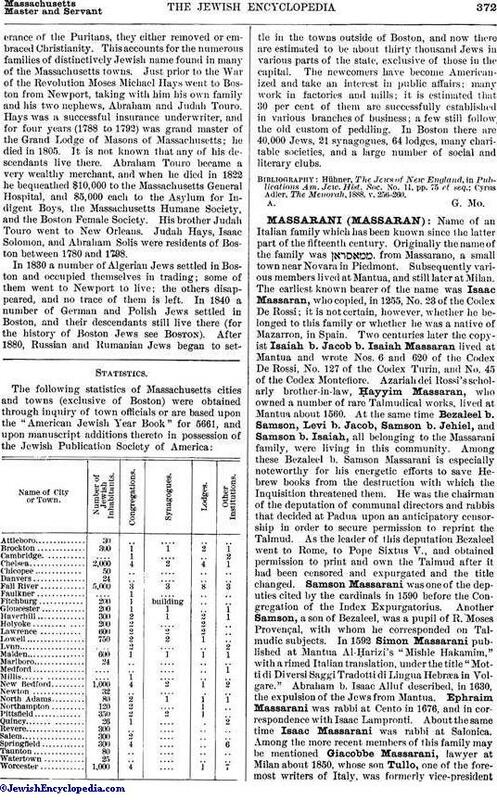 The earliest record of a Jew in Massachusetts bears the date of May 3, 1649, and refers to a certain Solomon Franco, for whom an allowance was made pending his return to Holland; and recorded among the inhabitants of Boston, in 1695, there are "Samuell, the Jew," and "Raphaell Abandana" ("Publications Am. Jew. Hist. Soc." No. 11, pp. 78-80). On Sept. 13, 1702, Simon the Jew was baptized at Charlestown, taking the name of "Barns," and about the same time a certain Joseph Frazon or Frazier lived in Boston. An attempt to convert him was unsuccessful, and it is recorded that he died Feb. 4, 1704, and that his body was sent to Newport, R. I., for burial. In 1722 Judah Monis was baptized; he was an instructor in Hebrew at Harvard College from 1723 to 1760. The first considerable colony in Massachusetts resulted directly from the Revolutionary war. In 1777 Aaron Lopez and Jacob Rivera, with fifty-nine other Jews, left Newport to find a refuge from its invasion by the British troops, and established themselves at Leicester, Mass. Lopez was a man of great wealth and, according to Ezra Stiles, in the extent of his commercial dealings was probably surpassed by no merchant in America (ib. No. 10, p. 15). He purchased an estate at Leicester and erected upon it a substantial house, which since has become the home of the Leicester Academy. The colonists rigidly observed the customs of their faith. In spite of the high opinion in which Lopez was held, it appears that in 1762 the supreme court of Massachusetts refused to grant the application of himself and Isaac Lezur for naturalization (ib. No. 6. p. 71). It is known that other Jews went to Boston during the seventeenth century, but owing to the intoleranceof the Puritans, they either removed or embraced Christianity. This accounts for the numerous families of distinctively Jewish name found in many of the Massachusetts towns. Just prior to the War of the Revolution Moses Michael Hays went to Boston from Newport, taking with him his own family and his two nephews, Abraham and Judah Touro. Hays was a successful insurance underwriter, and for four years (1788 to 1792) was grand master of the Grand Lodge of Masons of Massachusetts; he died in 1805. It is not known that any of his descendants live there. Abraham Touro became a very wealthy merchant, and when he died in 1822 he bequeathed $10,000 to the Massachusetts General Hospital, and $5,000 each to the Asylum for Indigent Boys, the Massachusetts Humane Society, and the Boston Female Society. His brother Judah Touro went to New Orleans. Judah Hays, Isaac Solomon, and Abraham Solis were residents of Boston between 1780 and 1798. In 1830 a number of Algerian Jews settled in Boston and occupied themselves in trading; some of them went to Newport to live; the others disappeared, and no trace of them is left. 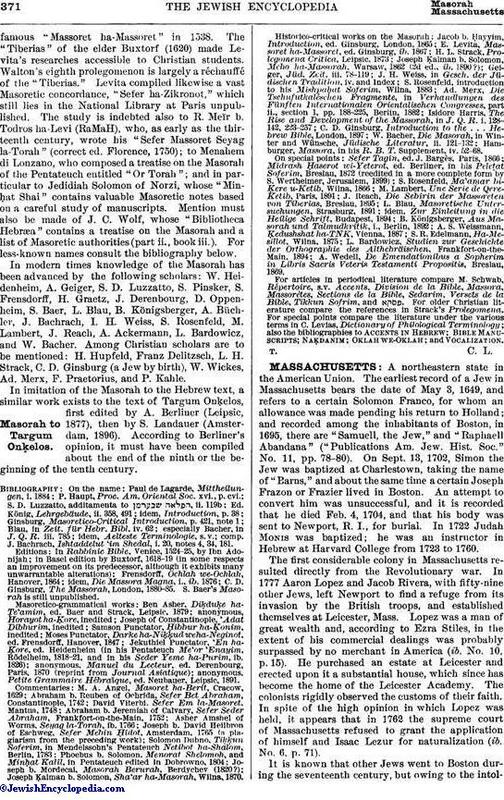 In 1840 a number of German and Polish Jews settled in Boston, and their descendants still live there (for the history of Boston Jews see Boston). After 1880, Russian and Rumanian Jews began to settle in the towns outside of Boston, and now there are estimated to be about thirty thousand Jews in various parts of the state, exclusive of those in the capital. The newcomers have become Americanized and take an interest in public affairs; many work in factories and mills; it is estimated that 30 per cent of them are successfully established in various branches of business; a few still follow the old custom of peddling. In Boston there are 40,000 Jews, 21 synagogues, 64 lodges, many charitable societies, and a large number of social and literary clubs. Name of City or Town. Attleboro 30 .. .... .. ..
Chicopee 50 .. .... .. ..
Danvers 24 .. .... .. ..
Faulkner .... 1 .... .. ..
Fitchburg 200 1 building .. ..
Holyoke 200 2 .... 2 ..
Lawrence 600 2 2 2 ..
Lowell 750 2 2 1 ..
Marlboro 24 .. .... .. ..
Millis .... 1 .... .. ..
Newton 32 .. .... .. ..
Northampton 120 2 .... 1 ..
Pittsfield 350 2 2 1 ..
Revere 300 .. .... .. ..
Salem 300 2 .... .. ..
Taunton 80 .. .... .. ..
Watertown 25 .. .... .. ..
Cyrus Adler, The Menorah, 1888, v. 256-260.